Summer hasn’t officially begun and already you find yourself climbing over bicycles to get into the house. Worse, perhaps you’ve run over a bicycle left in the driveway. It’s difficult to find room in the typical garage for everything your family needs to store. No wonder homeowners often surrender the garage to their kids’ bikes during the summer months. However, surrender isn’t the only option. An organized garage that can accommodate your active family and your vehicles is possible. The storage capacity of any garage can be increased. However, your family’s lifestyle dictates your storage needs. 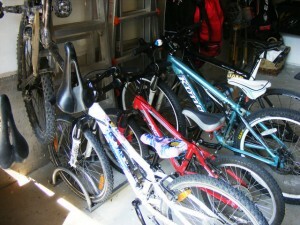 So the first step to finding the right bike storage solution for you is to assess your family’s overall needs. In addition to parking your vehicles and safely storing the family’s bikes, you might also require space for tools and gardening utensils. Perhaps you’d like a workbench or space to store the kayak you’ve always wanted. Your garage renovation plan should accommodate all of these factors. If that seems overwhelming, consider hiring a garage renovation specialist to devise and execute your plan. Once you’ve got the complete plan in mind, it’s time to choose a bike storage option that works for your family’s lifestyle. Let’s review three possible storage solutions to see which one will work best for you. Remember riding your bike to school and locking it to the bike rack? A similar style of bike rack can be used in your garage. The traditional (or schoolyard-style) bike rack is easy for kids to use. They simply roll the front wheel into the rack and engage the kickstand. However, the traditional rack has a large footprint, requiring lots of valuable floor space. A schoolyard-style bike rack requires enough space to accommodate the rack and the bikes that will be stored there. 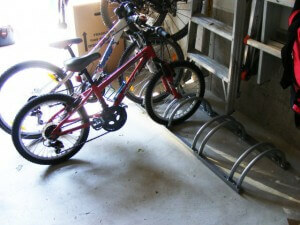 This style of bike rack works well, if you have a deep garage with sufficient space along the back wall. Another option is to park one vehicle outside and utilize that space for the bike rack during the bike riding season. 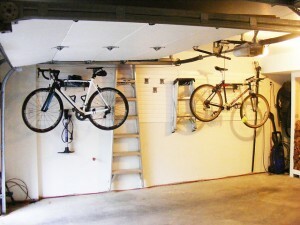 As garage renovation specialists, our goal is to help you store all of your bikes and vehicles inside of the garage. However, over the summer, some clients choose to park one vehicle outside in order to make bicycles easily accessible to small children. During the winter months, the bikes are stored along the wall or overhead so that the vehicle can return to its space inside the garage. A second option is to hang the bicycles flat against the wall. This requires the installation of strong, durable slatwall panels which come in a variety of attractive colours. When paired with compatible Camlock hooks, shelves, baskets or racks, slatwall creates a completely customizable organizational system. Bike racks can be inserted into the slatwall to hold each bicycle. The bike must be lifted onto the rack. Therefore, the height and physical ability of each rider determine the height at which the slatwall and racks are installed. Since the bikes hang flat against the wall, horizontal storage is ideal for sidewalls. 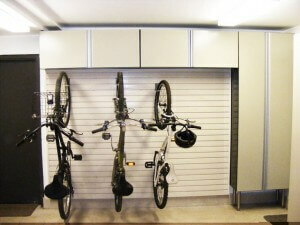 Another option, which also relies on slatwall panels, is hanging bikes vertically. As with horizontal wall storage, storing a bike on the wall vertically requires lifting the bike. However, since vertical wall storage requires that the front tire be hung on a hook, lifting the bicycle this way is physically challenging. Vertical bike storage can be quite attractive. However, because of the strength required, it isn’t recommended for anyone with weaker upper body strength, including young children. Some families use vertical bike storage to store bikes during the winter months while using a traditional, schoolyard-style rack for the summer months. When storing bikes on the wall vertically, the full height of the bike extends from the wall. 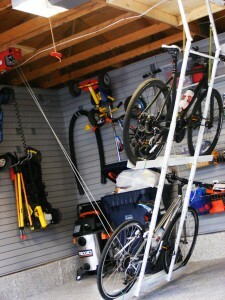 Therefore, vertical bike storage is usually only recommended for back walls. If installed on a side wall, the extension of the bikes might impede vehicles from entering the garage. Look up for the third option. The area overhead in a garage is often wasted space, but it has lots of potential. However, since it isn’t easily accessed, overhead space is typically reserved for storing items not frequently used. Sounds great for storing bikes during the winter months, but is it feasible for the months when your bikes are in constant use? Absolutely! Bike pulley systems enable bikes to be stored overhead and easily accessed. Motorized pulley systems can store up to five bikes. Many feature one-touch control, so anyone can operate them. Overhead bike storage is an excellent use of wasted overhead space. However, in order to install the five-bike overhead pulley system, the ceiling height must accommodate the height of the bicycles plus allow for 60-inches of clearance. Since this type of overhead pulley system requires a high ceiling, it isn’t right for every garage. 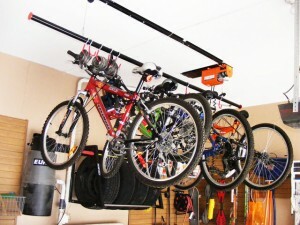 An alternate option for overhead storage is the two-bike pulley system which stores the bikes overhead flat against the ceiling. Therefore, it doesn’t require as much clearance space. Which bike storage solution is right for you? A garage renovation specialist will help you choose a creative bike storage solution that fits your space and unique lifestyle. However, bikes aren’t the only sports equipment stored in the garage. 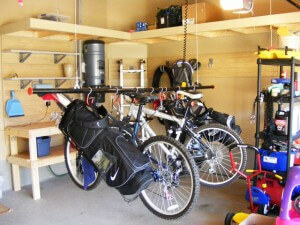 Next time we’ll discuss creative solutions for organizing the other sporting goods stored in your garage.